Order the Making of a Prophet Megakit and you’ll receive 2 softcover books, 4 e-books, 2 CD audio teachings, 2 videos, and 4 MP3s. That’s over 40 hours of prophetic ministry training! It’s also a $197 value—for only $97. Prepare for the office of the prophet, flow in a more powerful prophetic anointing, keep the spirit of Jezebel out of your ministry, enter prophetic ministry, stand in the office of the prophet, wield the weapons of prayer, engage in prophetic intercession and spiritual warfare, and much more! This brand new prophetic training will help you root out the issues that are holding you back from your prophetic destiny and equip you to walk in your prophetic calling. Prophets may be called from their mother’s womb, but prophets aren’t born overnight. Prophets may be called to the nations, but prophets aren’t commissioned on a whim. Prophets go through a making process that shapes the character of Christ in them and crucifies carnal impurities as they gain experience in the ways of God. Some call it spinning on the Potter’s Wheel. Others call it preparing for the office of the prophet. Either way, you need prophetic education for ministry. Do you have questions about the prophetic ministry? Wonder if you are called to be a prophet? Need to know how to battle demonic strongholds? Want to learn how to work with an apostle? Need some insights into how to withstand the pressure that comes with prophetic ministry? Want to mature in the prophetic? Do you want to get equipped to prophesy to the nations? It’s time for you to get serious about your prophetic calling. Isn’t it time for you to get read for where God wants to take you? This prophetic training kit of prophetic ministry resources will answer some of the questions you didn’t know who else to ask—or that you may not even know to ask. This prophetic training kit will offer insights into what you can expect while God is preparing you for the office of the prophet—and how to respond to the prophetic call. As a Spirit-filled prophetic person, you don’t have to attend a school of the prophetic to get the information you need to walk in the office of the prophet. You can tap into prophetic ministry training materials that the Holy Spirit can use to give you practical words of wisdom that will help prepare you for your prophetic calling. I’ve paired my best-selling book with several of my MOST popular teachings that will help equip you to go walk in your prophetic vocation. 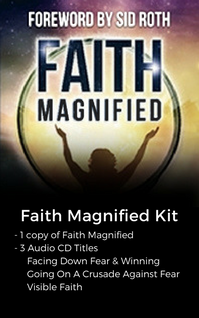 In the Making of a Prophet Megakit you’ll receive 2 softcover books, 4 e-books, 2 CD audio teachings, 2 videos, and 4 MP3s. That’s over 40 hours of prophetic ministry training! It’s also a $197 value—for only $97. Check out the resource list below, and shoot me an e-mail with the prophetic questions that are on your heart. 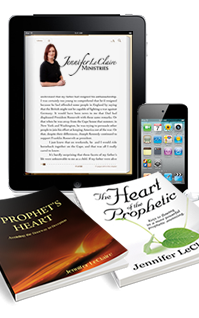 Prophetic Resource 1: The Heart of the Prophetic: Keys to flowing in a more powerful prophetic anointing. I believe solid teaching on what it really means to stand in the office of a prophet can help us avoid the pitfalls that the devil has laid out for us. The true prophetic ministry is not at all glamorous. It’s full of sacrifice and suffering for the will of God. Need to hear God’s voice clearly when all hell is breaking loose against you? Check out this prophetic teaching. Need a greater revelation of spiritual warfare? This podcast offers an apostolic-prophetic take on intercession. Prophetic worship music to soak in. Prophetic praise that will move yourt heart toward God. 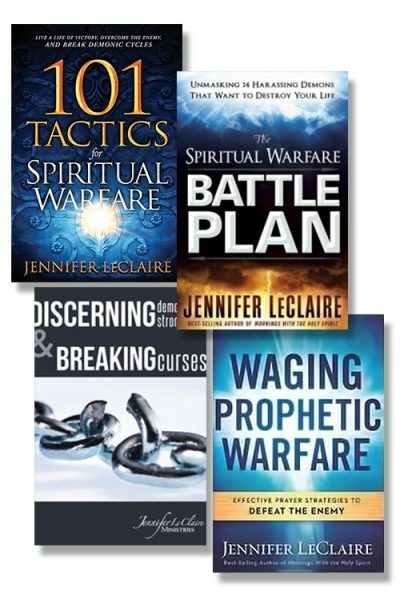 “Jennifer LeClaire’s book, in my estimation, is one of the best books on prophecy available. Very informatively, she writes as one who believes, understands and participates in prophecy. 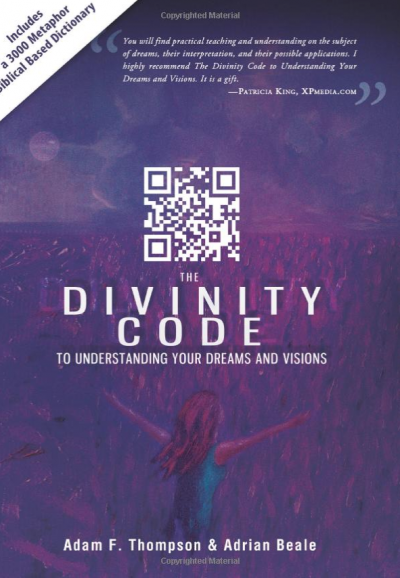 The reader catches her intense desire to see the gift of God function powerfully in prophets of integrity. She describes about a dozen prophetic types, using illustrations, history and abundant Scriptures in a most entertaining way. This book will help anyone interested in the prophetic understand the high and holy calling – and proper function – of prophecy in today’s church.”–Ernest Gentile, author of Your Sons and Daughters Shall Prophesy and Why Apostles Today? Order now and you’ll get links to your digital files e-mailed to you right away and your books and CDs will be rushed to you! Start getting equipped right now!